Giannis Antetokounmpo returned to the lineup and led all scorers with 27 points as the Milwaukee Bucks routed the Miami Heat 116-87 on Friday night at Fiserv Forum. 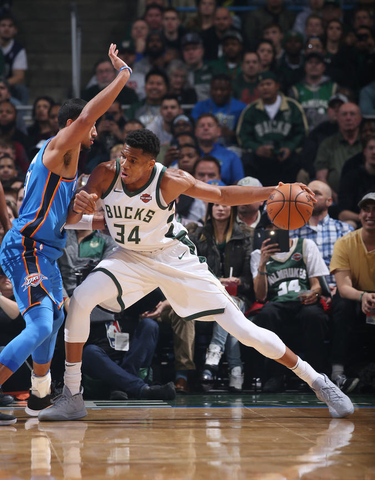 Giannis added eight rebounds and seven assists for the Bucks, who also got 18 points from Khris Middleton. Defensively, the Bucks held the Heat to 37% shooting from the field and 29.7% (11 of 37) from three-point range. Hassan Whiteside led the Heat with 14 points and 10 rebounds off the bench. The two teams split their four game season series but may not have seen the last of each other this season. If the playoffs were to start today, the Bucks would be lined up to face the Heat in the opening round of the playoffs. The Bucks have a three-game lead on the Toronto Raptors, plus the tiebreaker with 9 games left to play. Their magic number to clinch the best record in the Eastern Conference and the NBA overall is down to 6. Any combination of Bucks victories and Toronto defeats totaling six would clinch the top mark for the Bucks. The Bucks return to action Sunday afternoon at Fiserv Forum against the Cleveland Cavaliers.